DUBAI: Debutant Sadeera Samarawickrama’s delectable 38 off 35 balls lit up the early overs of the twilight session, but it was Dimuth Karunaratne’s steady application that carried Sri Lanka onward, to 174 for 3 at dinner. Karunaratne sits on 89 off 182 balls at the break, a rare first-innings century in sight for him. At the other end, Dinesh Chandimal had ambled to 14 off 66 balls, and was perhaps guilty of allowing a little momentum to leave Sri Lanka’s innings. Having earlier survived Mohammad Amir’s swing and an intense Wahab Riaz spell, it was Yasir that Karunaratne spent most effort defusing after tea. In evidence, already, was plenty of spin – slower than Yasir would perhaps like, but still enough to make the occasional ball spin past the edge and prompt worry in the batsman. Right through the session, Karunaratne’s footwork was immaculate, even if he was – on occasion – fooled by the slider. He scored most heavily on the legside as the ball turned sharply into him, but he did also venture a couple of reverse-sweeps, to moderate effect. Earlier, Samarawickrama’s ploy had been to attack Yasir, smoking him through cover in the first over after tea, then running down the pitch to crack him inside-out over the infield. When he came at Yasir to launch him over the straight boundary, Samarawickrama’s considerable talents had been showcased. In between these strikes, he had also pulled Wahab to the long leg boundary, and dispatched him through cover with a crisp drive. So good a maiden innings had it been, it was surprising how tamely it ended. Mohammad Amir, who came on after Samarawickrama had shellacked Yasir out of the attack, delivered a short ball, which the 22-year old merely bunted back down the pitch. Diving athletically to his left, Amir took the catch – his first wicket of the series. After that dismissal, Sri Lanka’s scoring rate slowed substantially, only 43 runs coming from the 23 overs leading up to dinner. Partly this was Yasir’s doing, as he settled into a beautiful length, Samarawickrama no longer around to hassle him. In any case, Chandimal has taken to making cautious starts. He had one run off his first 21 deliveries, and then when he attempted a full blooded drive, was almost caught by Mohammad Abbas at square leg, who perhaps should have positioned himself better than he had. The four that resulted from that shot was Chandimal’s only boundary of the session. 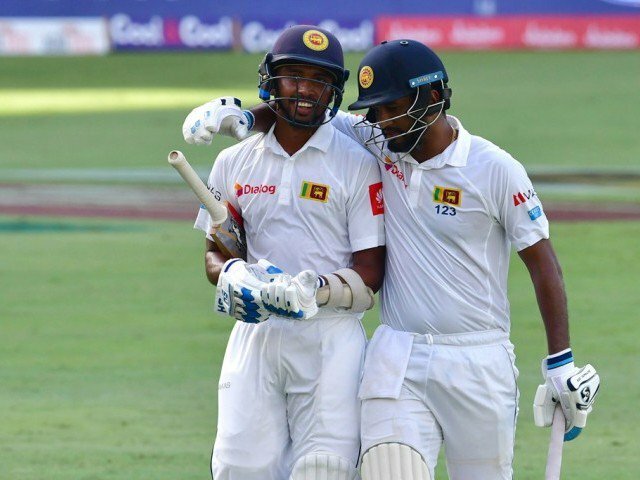 In his company, Karunaratne also slowed down, respecting Wahab and Asad Shafiq, where while Samarawickrama was at the crease, he had been in a more aggressive mood. Despite Samarawickrama’s strokeplay, Sri Lanka will worry now about the form of Kusal Mendis, who in attempting to clear his front leg and drive Yasir down the ground, sent a sharp catch to Shafiq at slip. It is his fifth failure in as many innings. That was Yasir’s second wicket of the innings. In the afternoon session, he had also had Kaushal Silva caught behind. On that occasion though, the batsman will perhaps reflect that he could have done better with the delivery he got out too. It had been a long hop.